This provider supports real-time streaming quotes from DDE-compliant applications such as MS Excel and OpenOffice Calc. DDE is just a source of pure real-time streaming quotes. Starting from version 2012.02, the DDE provider supports backfill using historical quotes from any static data provider, in any bar scale. There exist so many different DDE implementations, making it impractical to create a universal DDE provider that is capable of working with any data vendor. Fortunately, Microsoft Excel or free OpenOffice/LibreOffice Calc is installed on almost any computer. An Excel/OpenOffice spreadsheet can be set up with DDE links coming from any number of data vendors, thereby linking Wealth-Lab to a source of streaming real-time quotes. As a prerequisite, you should subscribe to a DDE-compliant data vendor (e.g. 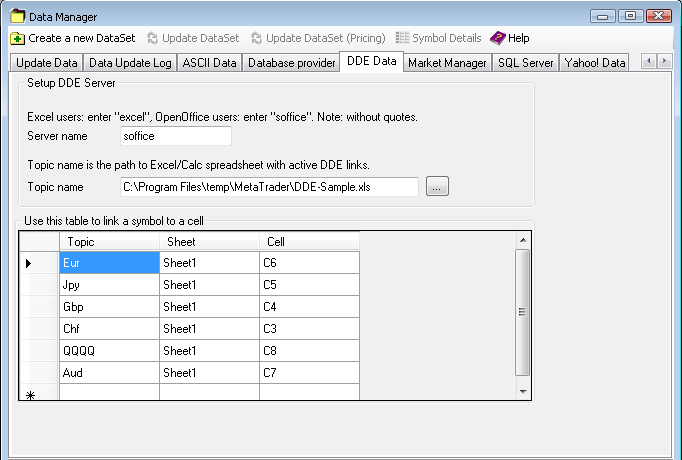 IB, IQFeed, Bloomberg, eSignal, MetaTrader, QUIK terminal and more) and be aware of how to connect their data source to Excel/OpenOffice using DDE. Specify your DDE server: in case it's Excel, type in excel; if it's OpenOffice, type in soffice. Note: without quotes or any other extra symbols. Specify so called "Topic" name which in this case is the path to the XLS/ODS spreadsheet by navigating to the file using the dialog box or typing in the complete path to the file. Finally, set up Aliases. 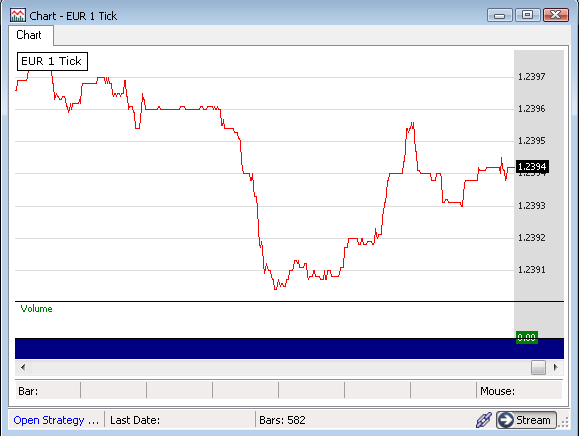 For example, if Bid quotes of Euro are flowing into the cell "C6" of your Sheet1, create a line with any valid symbol name such as EUR as the Topic, Sheet1 as the Sheet, and C6 as the Cell. Note: Sheet1 is the sheet name with live DDE links and not the name of the file! Excel users: It's not possible to use the links like "C6" with Excel, you have to use absolute addressing only i.e. "R6C3" aka row 6, column 3. Users of international Excel versions - correct this accordingly (e.g. Z6S3 for German Excel). Open up Wealth-Lab's Preferences dialog (hit F12) and enable "DDE Streaming" as the source of streaming quotes. Close the dialog and you're all set up to watch streaming quotes in Quote Manager and streaming charts. Excel/OpenOffice must be running in order to receive streaming updates. Load a Wealth-Lab static chart with the symbol equal to the one you added to the "DDE Data" tab. The DDE provider will backfill the chart using the saved historical data and add any streaming updates to the partial bar. The static provider can be any, as well as the bar scale. If you have trouble connecting to an otherwise valid DDE source, try starting Wealth-Lab as admin explicitly (by right-clicking shortcut and selecting "Run as administrator"). Versions before v2012.02 did not have the historical backfill capability, so they always started with an empty chart. Don't try to connect to data vendors directly, bypassing Excel/OpenOffice - this is not going to work. If you have the "DDE Dummy" DataSets created in previous versions (before v2012.02), they are not required and will no longer work so it's better delete them at earliest convenience. Source code for a previous version is provided for educational purposes and your usage is unsupported.